The Dufour 36 Performance is a true dual purpose boat, she is at home as a cruiser or racer – her lines are designed for speed, space designed for comfort. She is wider giving greater stability and comfort under sail but her lines shout speed for anyone who sees her. There is no longer a need to compromise. 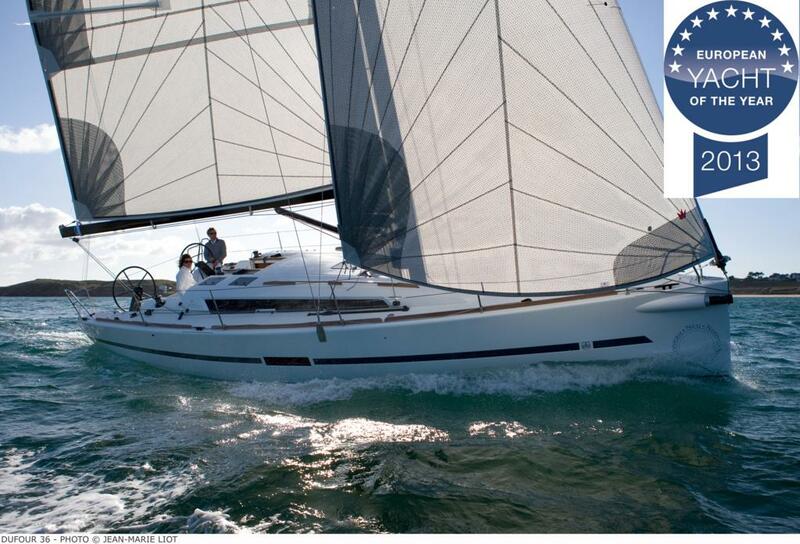 The Dufour 36 Performance is responsive and thrilling to sail, yet easy to handle, the Dufour 36 Performance will quickly appeal to those who demand more pleasure, enjoyment and exhilaration from their sailing. The wider mid beam and greater topside flare results in reduced drag and improved stability; the larger sail plan gives more power when required. The wide, open cockpit allows comfort and efficient sailing with controls placed to facilitate shorthanded sailing; removable cockpit table and storage lockers give ultimate flexibility, perfect for cruising or racing. The Dufour 36 Performance is spacious and well appointed accommodations provide comfort underway for families, friends and crew! The hull and deck port lights provide bags of natural light; Natural Moabi woodwork provides warmth and functionality. The spacious feeling is enhanced by double doors into the forward cabin. Both cabins on the Dufour 36 Performance can be split into separate sleeping bunks providing ultimate flexibility.